Catholic News World : Wow Football Star Antoine Greizmann who Helped France Win the World Cup says "By influence, I bathe in religion since childhood...."
Wow Football Star Antoine Greizmann who Helped France Win the World Cup says "By influence, I bathe in religion since childhood...."
Antoine Griezmann started his career with Atlético Madrid and then the Team de France but also his faith. Team France won the World Cup 2018 against Croatia with his help. Antoine was born on March 21, 1991 in Mâcon, France. Early in his career he was rejected by teams in France due to his small size. "By influence, I bathe in religion since childhood.... I continue, punctually, to light candles in the churches..."said Griezmann. Like some of his teammates his tattoos express faith; he has a tattoo of Jesus above a Christ the Redeemer statue, but also a set of rosary beads Rosary of the Virgin Mary, to whom he explains his mother often refers. His mother is a fervent Catholic. "I feed on all beliefs," said Griezmann. 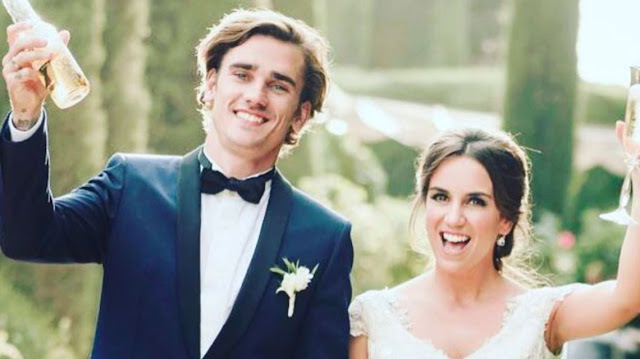 Antoine married his wife Erika Choperena from Spain in 2017. They have one daughter, named Mia, whom they recently baptized. His sister, Maud, was miraculously freed from the Bataclan attack in France. Antoine Griezmann did not fail to thank "the one who is above ...".